Question: What is a caravan club? Answer: A group of caravan/recreational vehicle owners with an interest in travelling one weekend in each month. Usually, this involves towing your van up to 300km to a Caravan Park. Often the destination is chosen for a particular feature, such as a beach, or to coincide with a local festival. Your investment of thousands of dollars is wasted standing inyour driveway. 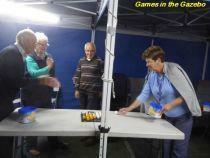 Caravan Club members have such a good time at Club Rallies they want to share it with you. If your caravan is parked in the back yard and is only brought out at Christmas and Easter, now is the time to dust off the spider webs and use it. You are invited to contact our Club Secretary to discuss our activities and program. If it sounds like a good 'fit' you will be invited to attend a few rallies (usually 2 or 3) to see if you've found your Perfect Match. Any fees, joining fees and subscriptions can be discussed with the Club Secretary. The Club publishes a monthly Newsletter with news of past and future rallies and articles of interest to members. The Club compiles a proposed program up to a year ahead and most will ask for expressions of interest in attending a particular venue. You will be asked to confirm your ability to attend closer to the event. (We know life goes on so attendance is not compulsory.) The Club travels about 300km on a 2-day weekend and will go further afield. This provides the option to see some of our great country within the safety of a congenial group. Caravanners make their own way to the rally venue in their own time and at their own pace. Generally the rally officially starts late Friday afternoon and continues to the conclusion of morning tea on Sunday. Most choose to arrive a day or two earlier than the 'official' rally and leave a few days later. When you belong to a Caravan Club you know that there are always like-minded, friendly people to travel with and who will greet you when you arrive. What will we do?.· Entertainment can be organised, depending on the location. If there is a Festival or Show in the town members would be free to attend the activities. Other entertainment may vary from a sausage sizzle, car observation run, games evening, film show, fancy dress evening, dance, card games etc. Attendance is optional - but always fun. For many, the daily Happy Hour is the time to have a chat and get to know your fellow travellers. At most rallies there is a shared meal or lunch or dinner at a hotel or cafe. Every two years a State Rally is held, when members from all clubs meet for a joint rally. And every three years a National Rally is held in a selected regional location. Although we share a name with other organisations, we are a completely autonamous club associated with only caravan organisations. The idea of forming a new caravan club was first conceived during 1974. Clubs at that time had waiting lists so the idea was to form a new club with the primary aim of “furthering and protecting the interests of caravaners, and to increase their enjoyment of this past-time”. The founders were all members of the Caravan Club of South Australia. The new club was to be somewhat different to the others, as members could run their own rallies if they desired which over the years, has displayed tremendous talent and very enjoyable rallies. 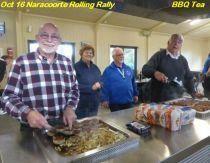 The setting up of the new club was achieved by the kind cooperation of the then President of the Caravan Club of South Australia and his committee, who after some convincing that the new club could set a high standard, handed over a copy of their waiting list with their blessings. During the October 1974 rally, the title of Southern Cross Caravan Club came about. An inaugural meeting was held, the Constitution and By Laws were set out and the first committee elected. Each family provided funds to cover initial expenses and the Club was duly registered in November 1974 and was to officially become the Southern Cross Caravan Club inc. The Club flag was displayed for the first time at the Dubbo National Rally which was made by four ladies of the Club from material purchased during the journey and handed from car to car. Still being members of the Caravan Club of South Australia, the new club was announced at the rally and duly invited to raise the new flag for the first time. Now established, the waiting list was the main hurdle. Would anyone turn up for the first rally of the new club? Twenty-four caravans attended the inaugural rally with nervous families finding that they “clicked” giving the committee encouragement to pursue their aims. The Club then grew, never looking back with a member limit of fifty having to be established. The original intention of using ovals as venues provided some picturesque and relaxing locations. As time went on, because families grow up and lifestyles change, the attendance numbers dropped off to the extent that there needed to be a change of rally venues from ovals. The answer to this was caravan parks which were more suitable for the rally numbers. After a taste of the luxury of power, water, hot water showers and sullage points, to settle for these luxuries was a bonus. 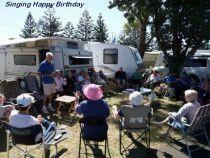 ASSOCIATION of CARAVAN CLUBS of SOUTH AUSTRALIA inc. The Club was one of the founders of the Association of Caravan Clubs of South Australia. Having been formed, the Association gave the Club the insurance of setting standards for caravan clubs in South Australia that were to share venues. The Association also enabled the Club’s voice to be heard on future caravanning laws and has assisted, over the years, to make its mark with the Caravan Trade and Caravan Parks Association. The Club is not unmindful of the difficulties and problems that have arisen along the way, nor of the anxiety over the health of our loved ones and Club members. Together they have overcome all their difficulties with the Club being firmly established as a place where members can all enjoy the good life together. The Club’s members have and always will be, very special people; people who you feel proud to be able to share with and call friends. Many close friendships have been formed with more forming in the future. The members can feel proud of their club as they take the Club into the future.